FRIDAY HARBOR, WASHINGTON—The San Juan Islands Museum of Art (SJIMA) presents an exhibition of work by Ai Weiwei, one of the most influential artists and most closely followed dissident political voices in the world. Ai Weiwei: Fault Line presents three pieces from his ongoing investigation into the 2008 Wenchuan earthquake, a magnitude 8.0 quake that killed over 60,000 people including 5,196 schoolchildren in Sichuan province, China. This is one of the first museum exhibitions of Ai Weiwei’s work in the Pacific Northwest. Ai Weiwei: Fault Line is a rare opportunity to see work by one of the world’s top artists. The Sichuan government refused to report how many schoolchildren died during the Wenchuan earthquake. In response, Ai Weiwei formed the Citizens’ Investigation, which both determined the death toll and revealed the corrupt bureaucracy that allowed for earthquake building codes to be ignored for schools. His criticism of the Chinese government has resulted in frequent clashes with the authorities and culminated in a secret detention for 81 days, in 2011. At the center of the exhibition is “Rebar and Case” (2014), comprising eight sculptural coffins containing marble replicas of the twisted rebar pulled from the rubble of the government built schools that collapsed in the Wenchuan earthquake. Provocatively, the marble used to carve the rebar is sourced from the same quarry as the marble used to make Mao Zedong’s mausoleum in Tiananmen Square. The second work in the exhibition, “Names of the Student Earthquake Victims Found by the Citizens’ Investigation” (2008–2011), is a massive work that includes all 5,196 names of the students who died in the collapsed schools—along with their gender, date of birth, age, school class, and address. The piece covers an entire wall in the museum. On Twitter, Ai Weiwei publishes the name of each student on their birthdays—an act of ongoing remembrance. The third piece is the video “Little Girl’s Cheek” (2008), which documents elements of the Citizens’ Investigation. This video presents original documentary footage of the earthquake’s deadly aftermath, the confusion, the grief, and the incredible challenges of bringing this story to light. Ai states, “It is a tradition for intellectuals to speak out against power. This is why artists and poets are so valued by society.” Ai does not interpret his own art, which is itself an important element of his work. He believes it is more powerful for viewers to form their own interpretations. Each interpretation then becomes a part of the piece itself, and those who engage in Ai Weiwei’s work play an active part in its existence. In the Pacific Northwest, the Cascadia Subduction Zone makes this show particularly relevant. This subduction zone, one of the most powerful megathrust fault lines in the world, hasn’t had a major slip in over 300 years, leading experts to assert that the region is overdue for a massive earthquake on the scale of the Wenchuan quake. SJIMA’s programming explores art as an intermediary between the human and the environment. Ai Weiwei: Fault Line articulates not only the destruction caused by earthquake, but the incredible challenges—and necessity—of creating truth and meaning in its aftermath. NOTE: The content of the video portion of this exhibition is graphic and disturbing. Ai Weiwei lives and works in Beijing. He was born in 1957, the son of Ai Qing (1910–1996), one of China’s finest modern poets and a defiant voice throughout the 20th century. In 1978, Ai Weiwei attended the Beijing Film Academy and, later, moved to New York (1983–1993) to continue his studies at the Parsons School of Design. Ai returned to China in 1993, to care for his ailing father. He began a series of conceptual and political works, such as Study of Perspective (1995-2011) and Dropping a Han Dynasty Urn (1995). In 2005, he began using social media to voice dissent and document his life. In 2008, he collaborated with Herzog & de Meuron in the design of the Beijing Olympic Stadium. In 2008, he set up the Citizens’ Investigation on the Sichuan Earthquake to investigate an 8.0 earthquake that killed thousands of people including over 5,000 schoolchildren when substandard school buildings collapsed on them. These investigations led to confrontations with authorities, including a beating that caused a cerebral hemorrhage, requiring emergency surgery. In 2011, Ai was secretly detained for 81 days without cause and would later be falsely accused of tax crimes. Major solo exhibitions include Ai Weiwei at the Royal Academy, London (2015), Evidence at the Martin Gropius Bau, Berlin (2014), Ai Weiwei: According to What? at the Hirshhorn Museum and Sculpture Garden, Washington D.C. (2012), Ai Weiwei absent at the Taipei Fine Arts Museum, Taiwan (2011), Sunflower Seeds at Tate Modern, London (2010), and So Sorry at the Haus der Kunst, Munich (2009). Among numerous awards and honors, Ai Weiwei received the lifetime achievement award from the Chinese Contemporary Art Awards in 2008 and the Václav Havel Prize for Creative Dissent from the Human Rights Foundation, New York in 2012. And, most recently, he was awarded the Ambassador of Conscience Award from Amnesty International in 2015. 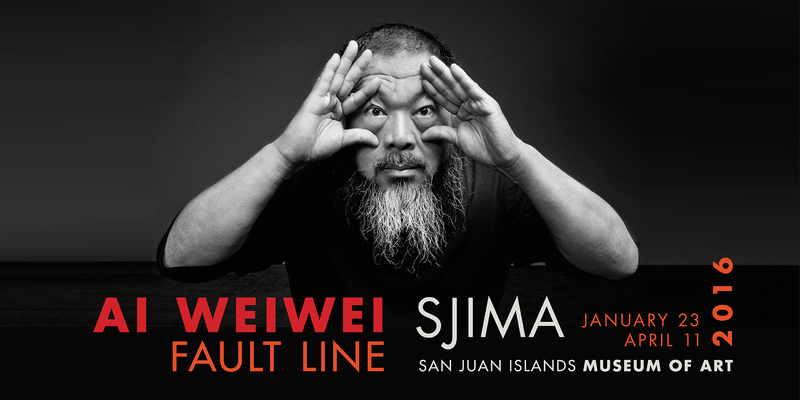 Ai Weiwei: Fault Line was curated by Ian Boyden, Executive Director of the San Juan Islands Museum of Art. With degrees in the History of Art from Wesleyan University and Yale University, Boyden’s exhibitions explore diverse subjects such as contemporary artists of the Northwest, Chinese calligraphy and scholars stones, and climate change. His work demonstrates ecological awareness, place-based thought, East Asian aesthetics, and intense interest in material relevance. For the past twenty years, Boyden has shared his time between the Northwest and China. As the Artist/Scholar-in-Residence at Suzhou University in 2011–12, he conducted research on Chinese inks and had a solo exhibition of paintings, books, and video installation at the contemporary wing of the I.M. Pei-designed Suzhou Museum in China. SJIMA is one of the newest visual art museums in the Pacific Northwest, officially opening its doors in 2015. SJIMA champions artists, the arts, and arts programming because it champions authenticity of expression, place, and connections. Through its exhibitions, education, programs, and events, SJIMA establishes the San Juan Islands as a place of legacy making—legacies of art-inspired transformations, of expansion and wonder, and of support for our artists and arts communities. Publicity images for Ai Weiwei: Fault Line available by request.